Minecraft Poll - How Do You Play Minecraft? 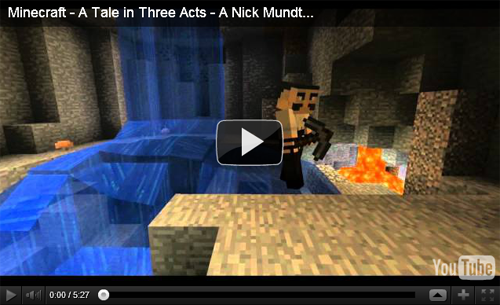 Mojang is curious how you're playing Minecraft! They would like to collect data on gamemodes, time played and myriad other details (but nothing personally identifying!) about how players are using the game, and they need your help! Notch has put forth the suggestion that the game be able to collect anonymous information during gameplay, so they can get a better idea of how people play Minecraft, and adjust the game to cater better to players going forward. This feature is not currently implemented, but Mojang would like to, and are asking for your input on the matter. You can help them out by voting right here! Jeb released a teaser image for a new jungle mob! 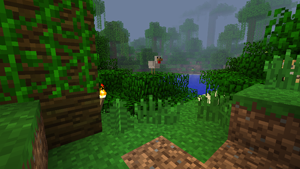 If you look in the image below - on the far right side of the picture - you can see the new little guy peeking out from behind some undergrowth, as a chicken stands guard. What could it be? A monkey? A lemur? A new type of creeper? We're not sure yet, but speculations run wild. What do you think it could be? Take a look at the picture below and tell us! We recently came across this silent film about a down-on-his-luck miner trying to make a new life for himself. Give it a watch, and let us know what you think! Tiger, I think so as well. i think of some kind of cat, perhaps a tiger? It's a cheeta. It has a few dark spots, or a tiger? Watch it be something no one expected. xD Its a Ti- Orange Pony! I'd be OK with them seeing how I play as long as I can disable it. My first thought was immediately "MONKEY" but on further inspection, the color is wrong, I think that it's a large jungle cat, maybe tiger, but it's light so maybe a jaguar. Probably a tiger though, they're more popular. At first I thought it was a monkey, but now that I read the comments and took a better look at it, a tiger could be possible. Regardless of what it is, I hope it can be tamed and bred, or just bred (pets be awesome), in fact it would be awesome to be able to tame all mobs like wolves and then breed them. Going to go with some type of jungle cat! Tiger. If you examine it it is white black and orange. Perhaps two adult tigers breeded to make a smaller one?